Our team of SharePoint Branding Experts can assist with the development of all versions of SharePoint including SharePoint Online. 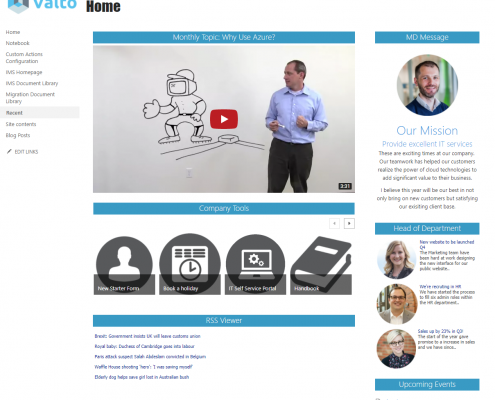 Our SharePoint Branding Specialists have worked on a huge variety of projects in the UK. Get in touch to talk with an expert about your requirements. With our SharePoint Branding service we can help your organisation to use your full corporate identity within your SharePoint powered Intranet or Extranet. We provide a full service that covers all aspects of design and deployment to ensure a consistent appearance across your digital assets. 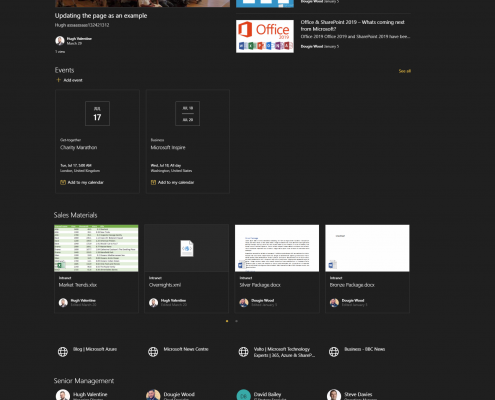 The modern SharePoint interface is designed to be functional and provide users with an intuitive environment to manage information and collaborate with colleagues. The standard User Interface uses Microsoft’s standard design language and as such is familiar for users. That said, in many cases, our clients want additional flexibility for the look and feel to match their other assets. To assist in this, our SharePoint branding service gives more flexibility in design. We’ll provide a fully customised SharePoint branding package that allows for more control over colours within the environment and allows for individual teams and departments to have control over how their information is presented. This can help to improve usability and helps new users to get to grips with finding information more quickly. We offer a range of solutions for SharePoint branding, from simple customisation of the interface including colours and layout through to more comprehensive design services that change all aspects of how users interact. Our core objective with SharePoint branding is to provide a simple to use, familiar environment that promotes collaboration and improves productivity. 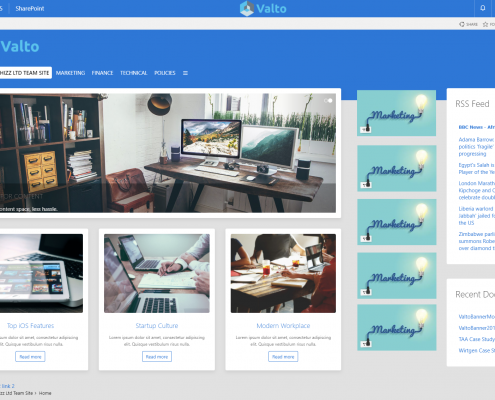 To find out more about Valto and how we can help you change the look and feel of SharePoint to meet your needs, please contact us today. 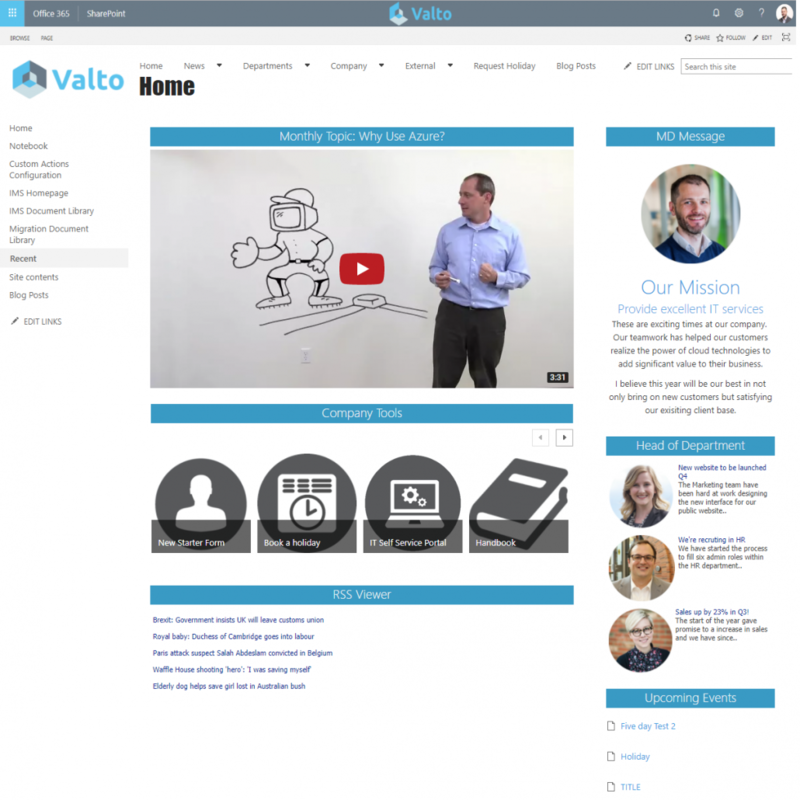 Find out how Valto can help you with SharePoint Branding. Call now on 03335 779 009. SharePoint is a hugely flexible platform for businesses to improve Collaboration and manage access to information within their network. With our SharePoint branding services, you get additional options for customising the look and feel of the platform which can help you improve adoption and make it easier for users. In addition to this, we can also provide support for older versions of the platform, however these may require additional customisation to be added and offer less flexibility. Simple configuration of SharePoint provides limited options for change. You have control over selected elements such as the logo and main colours that form the interface, however beyond this, the ability to match corporate identity is limited. For simple installations, and many use cases, this can be sufficient, however you may want to achieve more differentiation – particularly for public facing websites. The modular nature of SharePoint Online means that some branding packages are available for installation. These offer more flexibility than simple config changes, and allow for additional functionality. 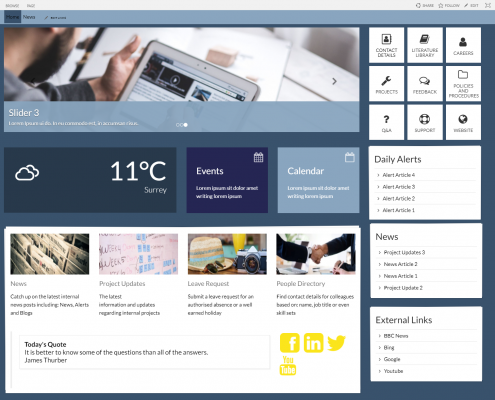 Common SharePoint branding packages include LiveTiles which enables more on screen functionality and greater ability to add information for users. 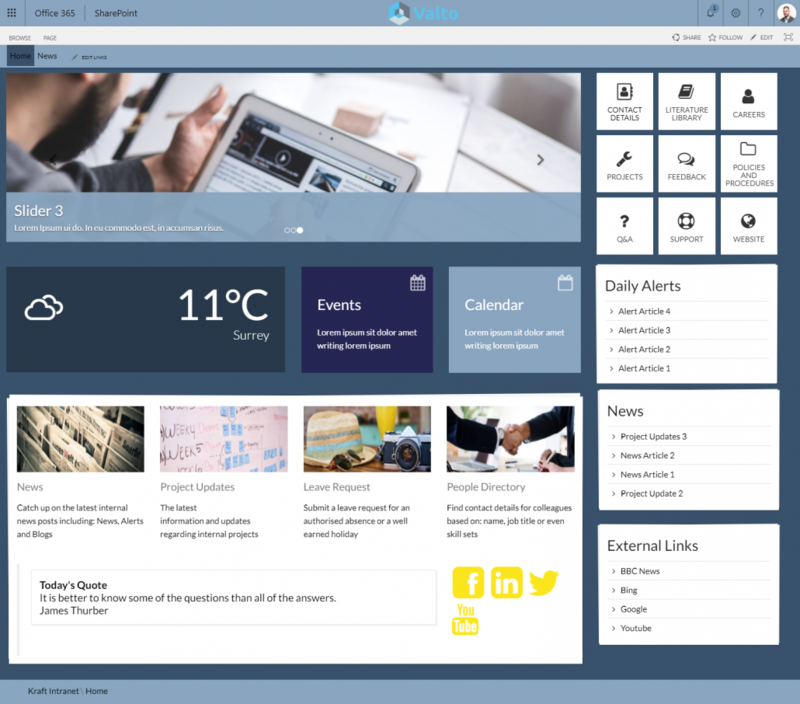 A fully customised SharePoint design is possible through the use of bespoke code. This can make delivering the project more complex, but also allows you much greater freedom as to how the user interface will look and perform. 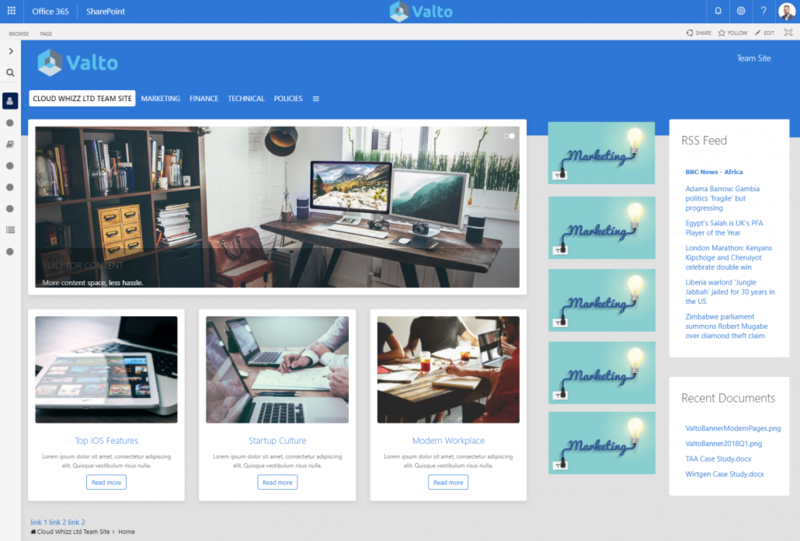 For more information about how Valto can help your business to achieve more with SharePoint and provide branding services for SharePoint Intranets, please contact us today. We brought Valto in to review our Azure infrastructure and spend. We heavily rely on Azure services and wanted an expert to cast their eye over our setup to see if we could make any savings or improvements. Valto gave us exactly that, they have helped us realise a 25% saving as well as optimising our setup for future growth. We brought Valto in to help with our SharePoint Adoption providing support, training and development. Valto are very knowledgeable, excellent customer service and I would have no reservation in recommending this company. 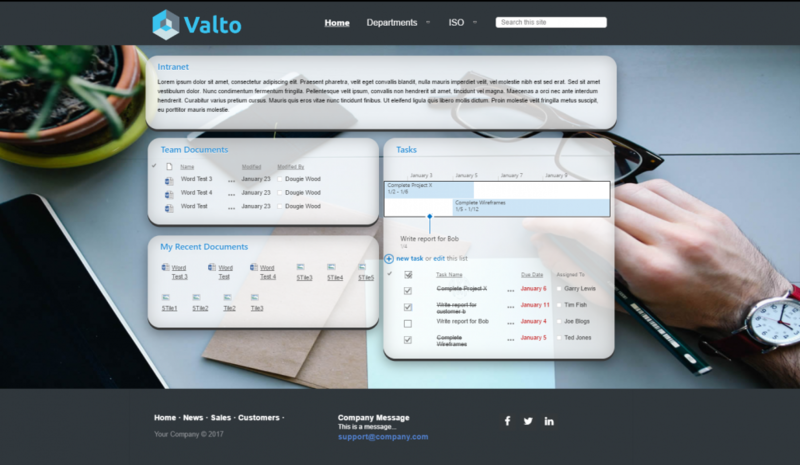 We called upon Valto’s services to assist with migrating to Office365. We had a range of different systems including 1&1, Google and Dropbox and Valto moved everything to the cloud with no downtime and a streamlined simple process. The whole process was very simple and we’d highly recommend the services to anyone. Valto helped us migrate to Office365 and provide ongoing support. They are an excellent business with knowledgeable staff. They have saved us a small fortune in downtime. Valto completely revolutionised our IT. We went through a process of upgrading all of our machines to the latest Surface & XPS devices, moved our emails over to Office365 and started utilising OneDrive and SharePoint to manage all of our files. Valto were able to help us understand how the right technology could make us more effective and look more professional when working with clients. Valto helped us with Advanced SharePoint and Office365 Training. Valtos expertise on the Cloud training were really valuable to me. The best money I have ever spent. 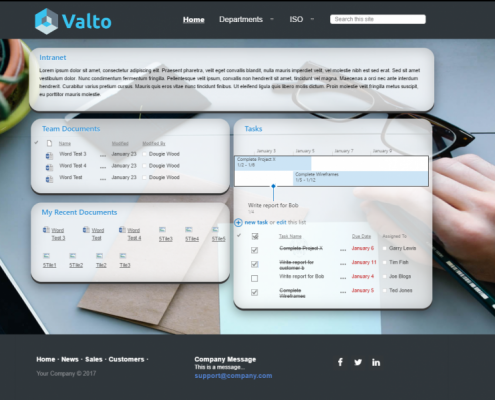 I could not recommend Valto to anyone more highly. Valto helped us move our web platform over to Azure which improved the load times of the webpage significantly and also helped us reduce the ongoing costs. Since moving our webpage our prospects have started engaging much better with our site which has led to improved conversions and more business!